One visible sign that your building needs underpinning is when cracks are visible. A building needs underpinning its foundation when cracks are wider than ¼ inch and there are some signs of a faulty foundation, especially diagonal cracks. Foundation failures could also be considered as heaved foundations, cracked or buckled walls and cracked concrete floors. The most used method of underpinning is mass pour method. This process requires excavating sections in sequence to a pre-established depth below the footing and place concrete on each pit. Repeat the method until the entire affected area has been underpinned. There are other methods and techniques to underpinning which are described in the following sections. Underpinning with screw piles and brackets is normally used in certain instances where traditional underpinning process is not possible. Some buildings might require excavating to great depths or maybe is unfeasible to use a piling rig making it ideal to use the screw piles and brackets method. The screw piles and brackets can be installed by only a two-man crew by hand or using small equipment such as a mini excavator. Screw piles can be installed in foundations having the capacity to work in tension and compression, withstand vertical and lateral wind forces, and vibration and shear forces. They are ideal when used with underpinning support brackets. The structure can then be lifted back to a level position and the weight of the foundation transferred to the pier and bracket system. Screw piles have many advantages over traditional pilings, such as the speed of installation, little noise and minimal vibration that may cause damage to the surrounding area. Underpinning with pile and beams is another great and preferred method to alleviate footing. 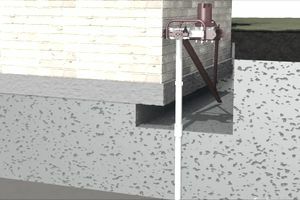 Using this system requires that a mini-pile must be installed on either side of the affected wall. After the piles have been installed, then brickwork is removed below the wall and reinforced concrete needle beam is used to connect the piles and support the wall. Underpinning with a piled raft must be used when the whole structure needs to be underpinned. It is recommended when foundations are too deep for other underpinning methods or in areas where the soil is so hard that small equipment could not excavate up to require depth. Piles are placed at determined locations by loading conditions; then pockets below footings are broken and reinforced needle beams are placed to bear the wall’s load. A ring beam is then built to link all needles and the structure is poured with concrete. Provides lateral and traverse ties throughout the structure. Economical at depths greater than 1.5m. No need for external access. Reduces disruption to drainage systems. Normally, this process needs to be designed or lead by a structural engineer for better results, but here are a few tips that will help you during the underpinning process. The underpinning process must be started from the corners and the working inwards. Underpinning must be made only on load-bearing walls. Do not underpin below non-load bearing walls. Start underpinning under a strip of footing. It is recommended to start with at least 3 feet long, two feet wide and two feet in depth. After the excavation has been completed, add concrete to the cavity. Concrete should be mixed using one part cement, three parts sand, and six parts aggregates. Remember to use formwork on the edges. Allowed concrete placed to set for at least two days. Use a rod bar ensuring that the cavity under the existing foundation is filled up. Ensure that the concrete is cured thoroughly before loading it. Once the concrete has gained sufficient strength, break off the projecting footing. Cut the concrete with the mass of concrete surface. Backfill and compact. If you are having problems achieving the required consolidation, use a hose to add water to the soil.